Bicycles are adding to Cambodia’s export basket, but at a price to workers. Credit: Michelle Tolson/IPS. PHNOM PENH, Jan 28 2013 (IPS) - Cambodia’s export business is in the process of changing due to shifts in manufacturing in Asia. 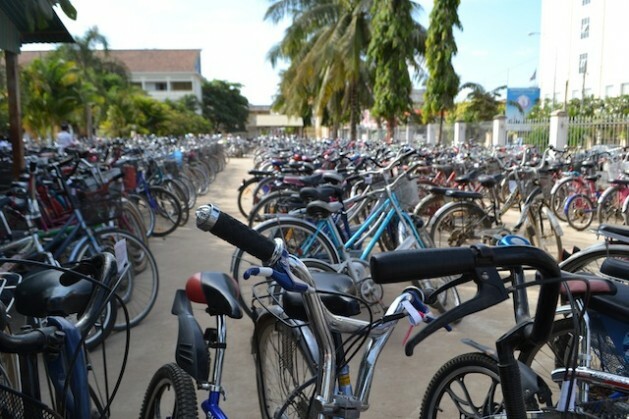 A business publication in the country has reported unexpected growth in the “machinery and transport equipment” sector and speculated it was as “probably bicycles.” But when Cambodia jumped into the top ten exporters of bicycles to the EU in 2012, it prompted the European Bicycle Manufacturers’ Association (EBMA) to investigate. In 2011, 366,000 bikes were exported from Cambodia to the EU but “in the first half of 2012 the country managed to almost triple its bike export to the EU. Cambodia’s exports totaled close to 520,000 units in the first six months of 2012 compared to 140,000 in the same period of 2011,” according to Bikeeu.com. The EBMA discovered that bicycle companies had moved their production to Cambodia from Thailand and China, citing increased expenses. The move is estimated to save 14 percent on taxes. A favourable scheme is in place for Least Developed Countries (LDCs) under the Generalized Scheme of Preferences (GSP) known as the Everything But Arms (EBA) agreement. The EBA allows countries ranked among the 48 LDCs to export products duty-free to the EU, except arms and ammunition. Introduced at the beginning of 2011, it ushered in a surge of 53 percent in export growth to European countries that year, making the EU Cambodia’s second largest export partner after the U.S., according to local business reports. Increasing expenses in China and Thailand have been attributed in part to rising wages. The minimum wage in Thailand was recently raised to 300 baht per day (10 dollars) and salaries in China in this business have risen to 400 dollars per month. By contrast, minimum wages in Cambodia are set at just 61 dollars per month. Strongman and A & J – listed as a subsidiary of Atlantic Cycle Co. – was reported to have originally opened their factory in Cambodia in 2005. A government website listing investments into the country shows three bicycle factories in the “Tai Seng zone” in the Svay Reing province – A &J, Atlantic Cycle Co. and Smart Tech – and a fourth bike factory, Best Way Industry, in the ‘Manhattan zone’ in Svay Reing. The Special Economic Zone (SEZ), according to a USAID report, offers pro-business perks to investors, a quick turnaround on red tape, low taxes, low wages, ease of doing business and a “young and educated” population. The report listed 1,500 workers in the bicycle industry. The minimum monthly salary then for factory work was 60 dollars a month, or 33 cents per hour, which would necessitate working six days per week to make 60 dollars monthly. Dated 2008, this shows that wages have not risen in four years. Local media recently revealed that a minimum wage increase for garment factories was in the works due to a labour shortage. Manufacturing overall has been shifting from China and Vietnam to Cambodia, and there are not enough workers in this country. The social affairs ministry has called for a wage increase but asked unions to agree on an amount – with suggested salaries ranging from 93 dollars to 150 dollars per month. Bicycle factory workers face similar labour issues to garment workers. Srun Srorn, activist and NGO consultant, explained how factory workers live on wages which amount to just two dollars per day. Some factories include a meal stipend with the monthly salary. Workers have short meal breaks and eat from vendors located just outside the factory gates. Some employers include a transportation stipend. There is no public transportation system in Cambodia, requiring workers to pay for motorbike taxi rides which cost 50 cents to a dollar. In mid-December 2012, local media reported 1,000 workers at a Smart Tech bike factory in Svay Rieng went on strike to raise their salary. Two months prior, another strike had been reported at A& J. Better Factories, an International Labour Organisation (ILO) programme, was created to help factory workers but at this time only assists garment factories, according to a spokesperson contacted by IPS. IPS spoke with Nhanh Kosol, one of the workers, about the strike for an update. Kosol said that their wage is still just 61 dollars a month but the factory had agreed to a transportation subsidy of 13 dollars per month and overtime pay. They can work overtime between two hours and five hours a day, depending on the factory. Overtime of five hours earns an additional three dollars. Bike EU listed the per unit price imported from Cambodia as about 200 euros. The U.S. has also recently had an upsurge in imports in bikes from Cambodia, according to foreign trade statistics. In 2009, 2.06 million dollars worth of goods were imported from Cambodia under the label “toys, shooting and sporting goods, and bicycles.” In 2010, the amount tripled to 6.8 million dollars and by 2011 it was 10.3 million dollars. When asked how much he thought the bikes he helped make sold for, Kosol said workers thought between 1,400 dollars and 3,000 dollars, the low end of which is 25 times his monthly salary.